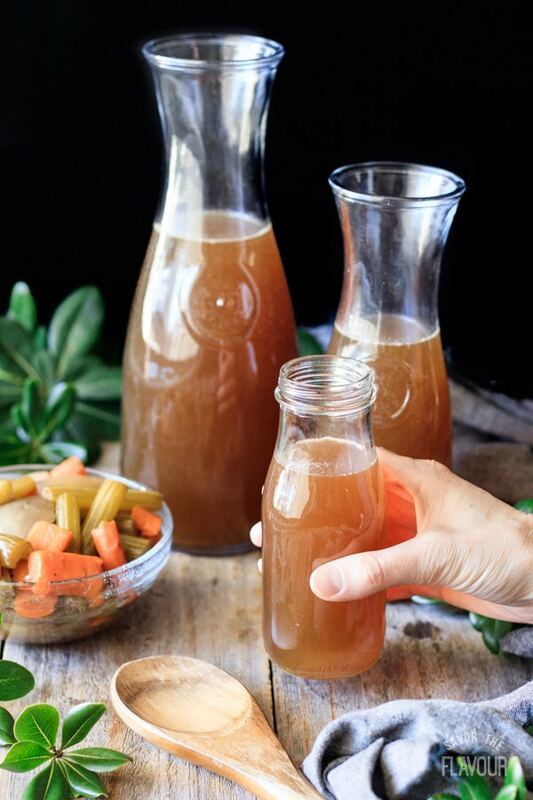 Crockpot roasted turkey broth is made with leftover turkey bones from Thanksgiving or Christmas dinner. 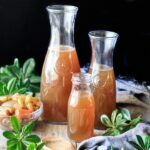 Learn how to make homemade flavorful broth that will improve the taste of your soups, gravies, and rice dishes. 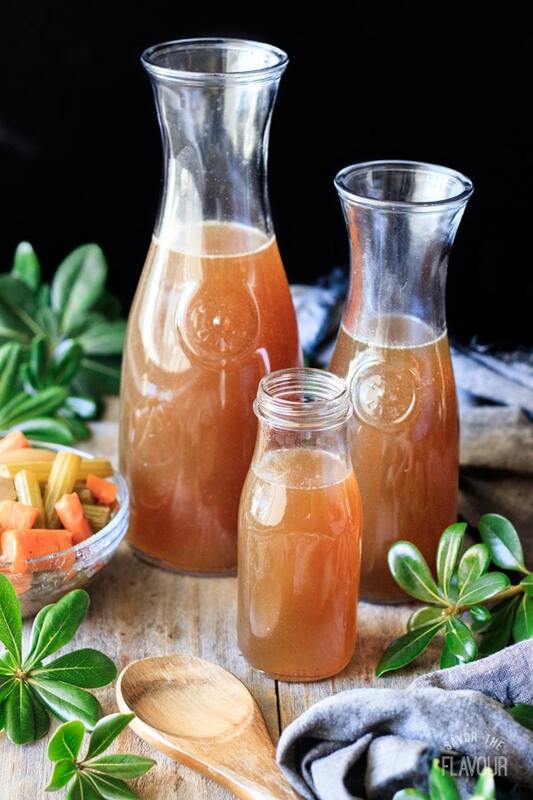 You can also enjoy the health benefits of sipping on delicious warm bone broth. Don’t throw away your roasted turkey bones! Use them to make homemade roasted turkey broth in your crockpot. 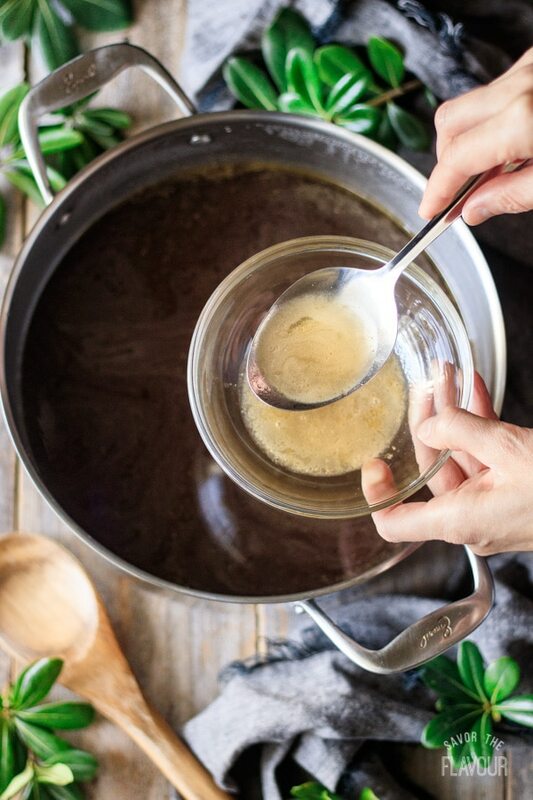 It’s wise to make use of the whole bird when you roast a turkey for Thanksgiving or Christmas, so keep reading to find out what to do to make your own low sodium broth. 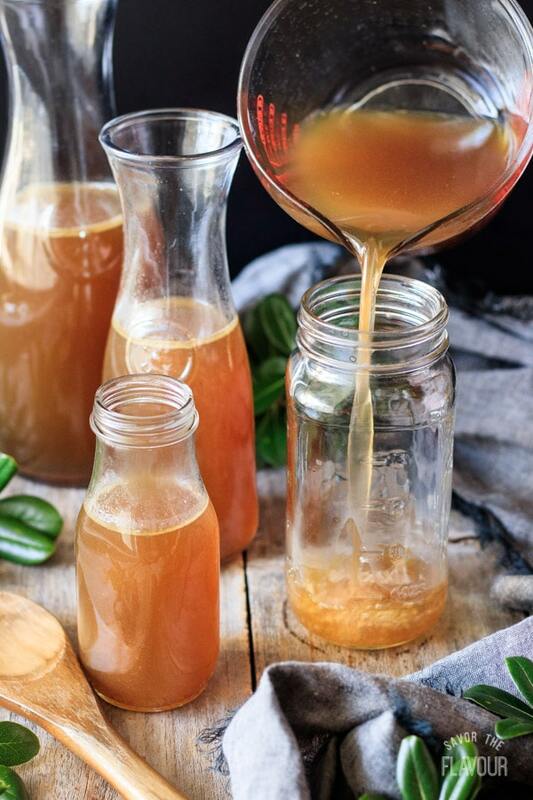 If you’ve never tried making homemade roasted turkey broth, you’ll be in for a pleasant surprise. Using the crockpot makes it super easy, plus it frees up your stovetop. The results of your labor will be a turkey broth that is a rich dark color, full of flavor, and packed with nutrients. 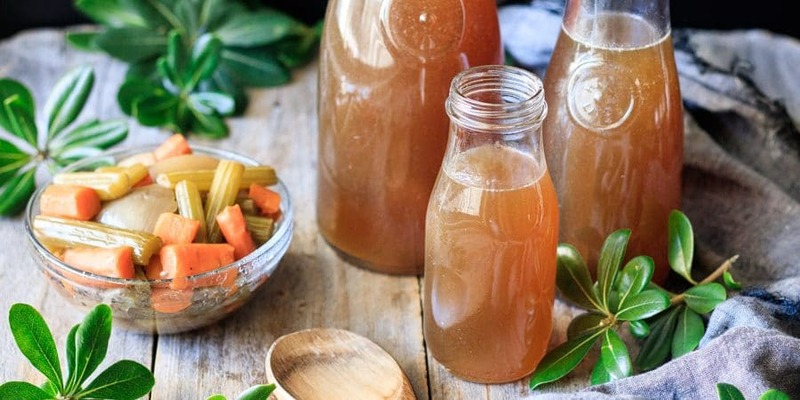 What are the health benefits of homemade broth? 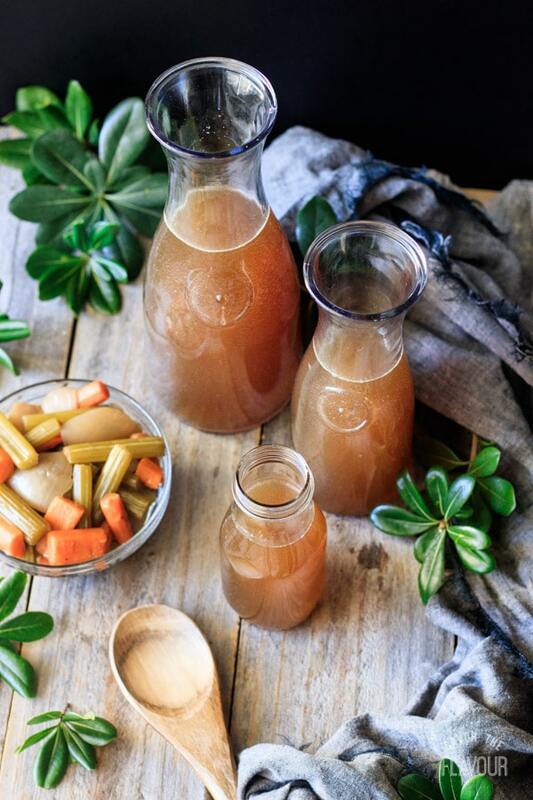 Drinking bone broth and eating soups with homemade broth have good health benefits. Source of gelatin, which is healthy for skin, hair, nails, and joints. Contains amino acids that boost gut health. Has many vitamins and nutrients. 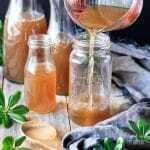 What uses are there for homemade turkey broth? Use it as a base for soups and stews. Use it instead of water for rice dishes. Use it as a base for turkey gravy. Use it in turkey stroganoff or turkey tetrazinni. Use it to drink warm for bone broth. How can I freeze turkey broth? In wide mouth canning jars, with a little headspace to allow for expansion. In ice cube trays at first, then dump the 24 ice cubes into one freezer bag. In one cup freezer containers, so it’s ready to use for rice dishes and making turkey gravy. In freezer zip top bags, just label your bag before you fill it. Squeeze out all the air and seal tightly. Preheat the oven to 450 F. Break up the turkey carcass, removing the skin (it makes the broth greasy) and most of the cooked meat off the bones. I used frozen turkey bones leftover from Thanksgiving, but you can also use bones from a freshly roasted or smoked turkey. Roast the turkey bones for 25 minutes at 450 F. Remove the bones from the pan and place inside a large crockpot. Quarter two large onions, leaving the skin on. Wash and cut the celery into 3 inch lengths. Wash, peel, and cut the carrots into 2-3 inch lengths. Roast in the oven for 20 minutes. Remove the vegetables from the roasting pan and place on top of the bones in the large crockpot. Put the metal roasting pan on top of a stovetop element that is set to medium high heat. Pour 1 1/2 to 2 cups of white cooking wine into the pan. Use a wooden turner to scrape the brown bits off the bottom. This is called deglazing the pan. Reduce the liquid to half the original amount, which should take only a few minutes. Pour the glaze over the roasted vegetables and roasted turkey bones that are in the large crockpot. 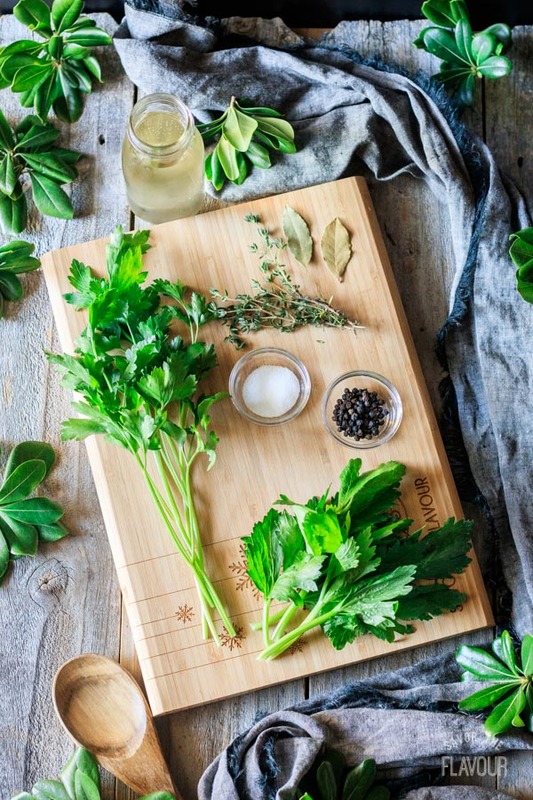 Gather the ingredients to season the turkey broth: fresh thyme, parsley, celery tops, bay leaves, peppercorns, and salt. Pour in 12 cups of filtered water, or enough to completely cover the turkey bones, vegetables and spices. Place the fresh parsley, celery tops, thyme, peppercorns, bay leaves, and salt on top of the water, turkey bones, and vegetables. Cover and cook on high for 1/2 hour, then reduce the heat to low and cook for at least 12 hours (up to 24 hours). Here’s what the broth looks like after 17 hours of cooking on low. Using a large slotted spoon or metal spider, remove the vegetables and spices from the broth. (You may want to use tongs to remove the larger turkey bones.) Discard the bones and spices. If you would like keep the vegetables, just rinse them and peel of the outer skin from the onions. Remove some of the fat from the top of the broth. Pour the broth from the crock pot through the fine mesh sieve into a large bowl or pot. Discard the peppercorns and other small bits. To get a clearer broth, strain a second time. This time, wet two pieces of paper towels to line the sieve. Pour the turkey broth through the sieve and into a large mixing bowl. Cool on the counter and refrigerate in an airtight container like a mason jar or glass carafe. If you want to freeze the broth in a mason jar, make sure to leave about an inch of head space for expansion. 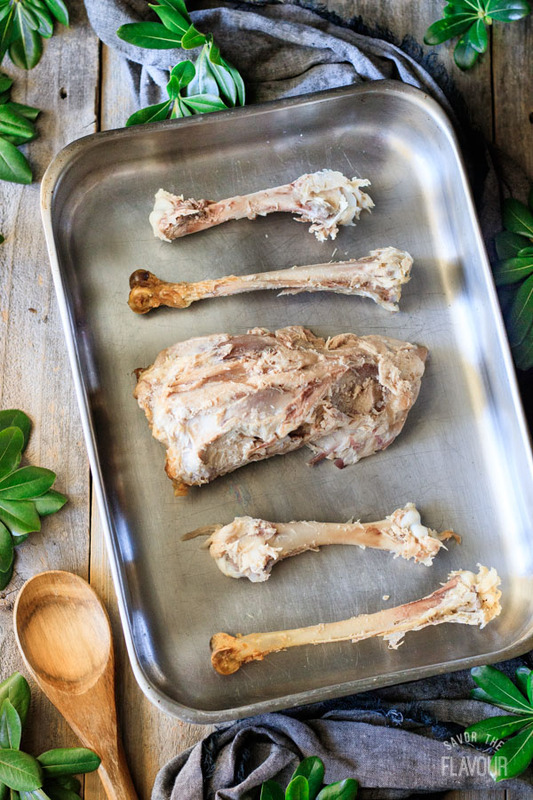 If you don’t have leftover turkey bones, just roast up some turkey drumsticks, then remove the skin and meat. Don’t leave the skin on the bones; it will make the broth too greasy. The easiest way to remove the fat is to allow the broth to cool completely, then refrigerate. The fat will rise to the top. Try using red onions, shallots, or leeks instead of yellow onion, but leave the skin on as it will help darken the color of the broth. Want to use other spices? Try fresh sage or rosemary. 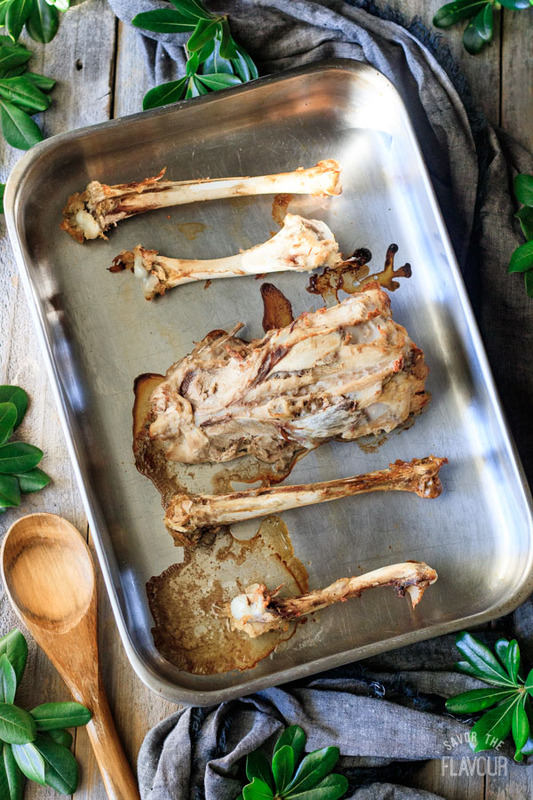 Rub the leftover turkey bones with seasoned salt before roasting them. Other things to add to your broth include 2 or 3 crushed garlic cloves, a dried chile, or thick slices of green pepper. When it’s cold outside, nothing is better than a big bowl of homemade soup. 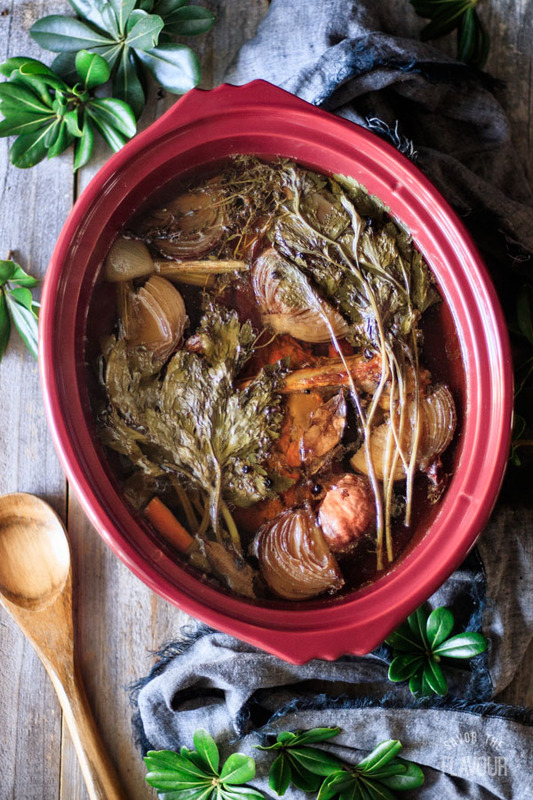 I encourage you to make homemade turkey broth in your crockpot. It’s so easy and it makes the house smell wonderful. Use this turkey broth recipe to make the best turkey noodle soup you’ve ever tasted. 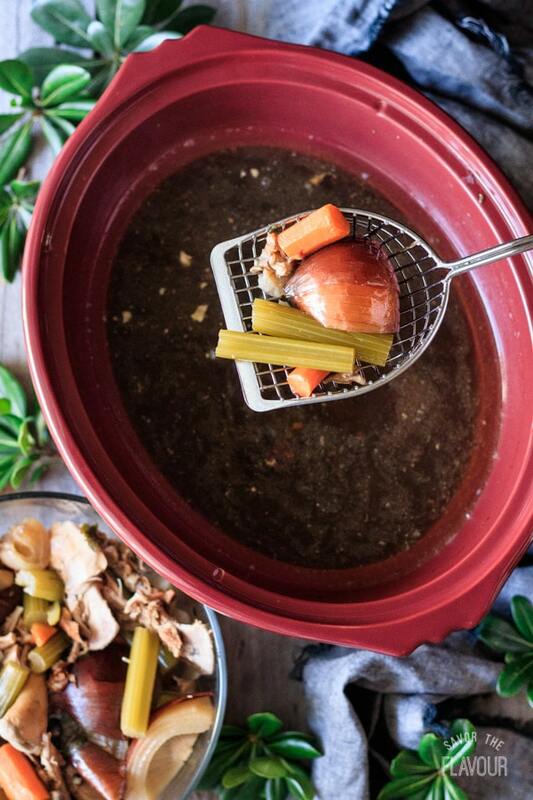 Looking for ways to use up your crockpot roasted turkey broth? Try these recipes. Turkey Noodle Soup: a colorful, meaty soup made with bone broth and healthy veggies. The Best Homemade Giblet Gravy: a comfort food classic that makes turkey and mashed potatoes even better. 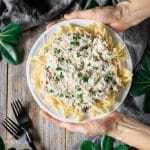 Creamy Turkey Stroganoff: a family favorite meal that uses up leftover turkey and gravy. 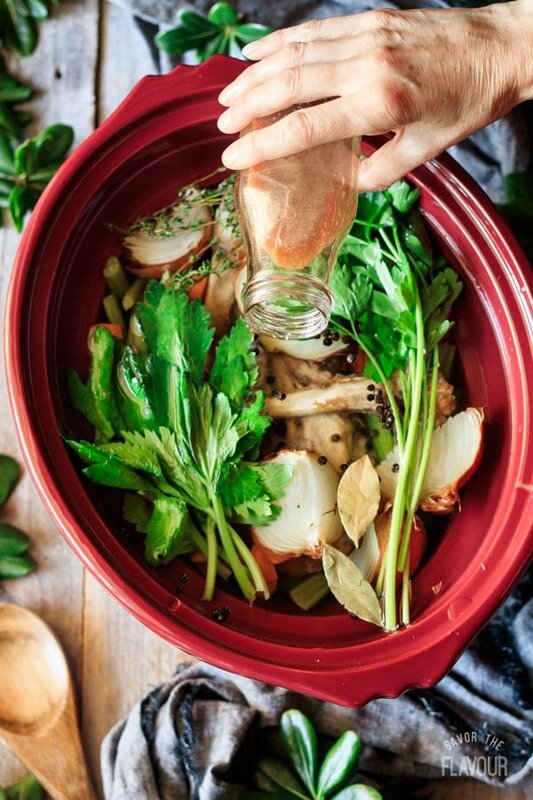 Did you make this crockpot roasted turkey broth? Please leave a star rating below the recipe to share how you enjoyed it. Preheat oven to 450 F. Place the turkey bones (with skin and meat removed) in a large metal pan with sides and roast for 25 minutes. Remove the bones from the pan and set aside. 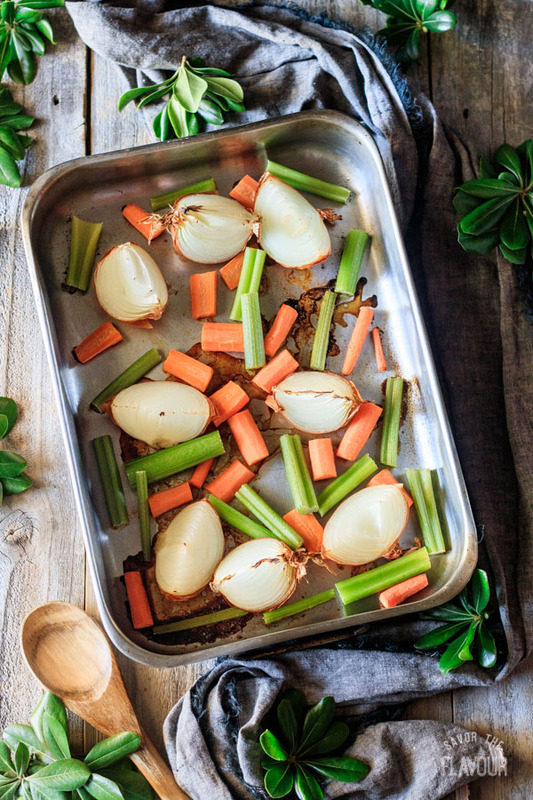 In the same roasting pan, roast the vegetables for 20 minutes at 450 F. Remove the vegetables from the pan and set aside. 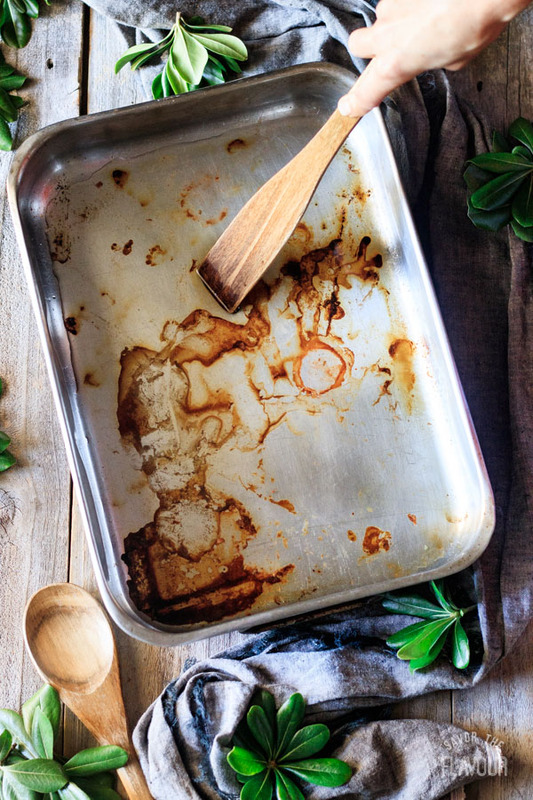 Put the empty metal roasting pan on top of the stove over medium high heat. Pour the wine into the pan and scrape all the browned bits off the bottom with a wooden turner. (This is called deglazing the pan.) Reduce the liquid to half. 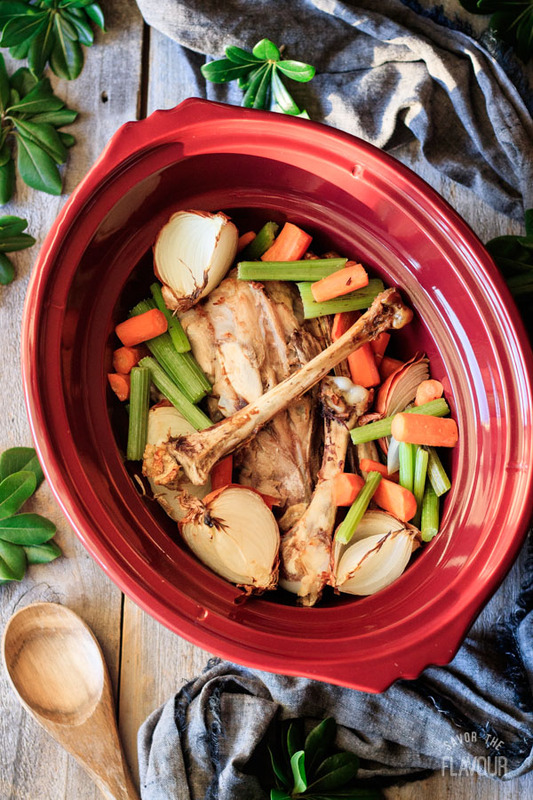 Place the roasted turkey bones and roasted vegetables in a large crockpot, then top with 12 cups of water. Add the fresh thyme, parsley, celery tops, peppercorns, salt and bay leaves. Skim off any fat with a large spoon and place in a small bowl. Cover and refrigerate so the fat can rise to the top. The rest of the broth can be reused. 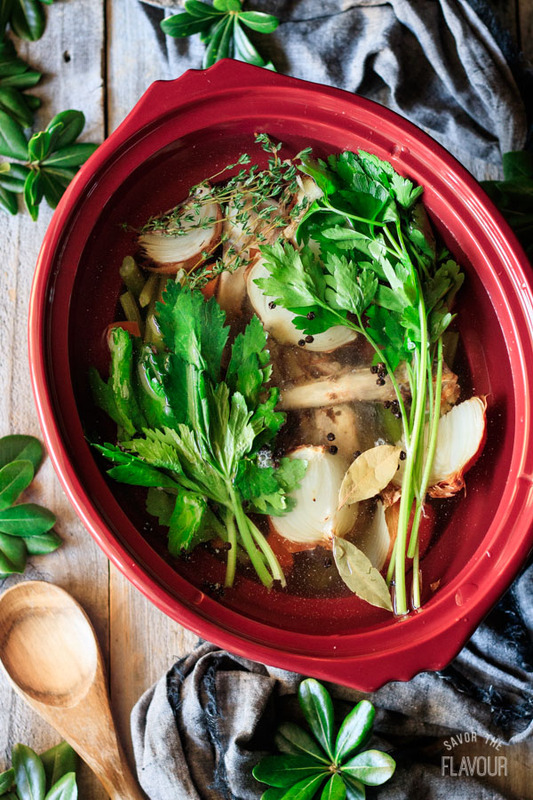 Remove the bones, vegetables, fresh herbs, peppercorns and bay leaves from the crock pot by using a large slotted spoon. 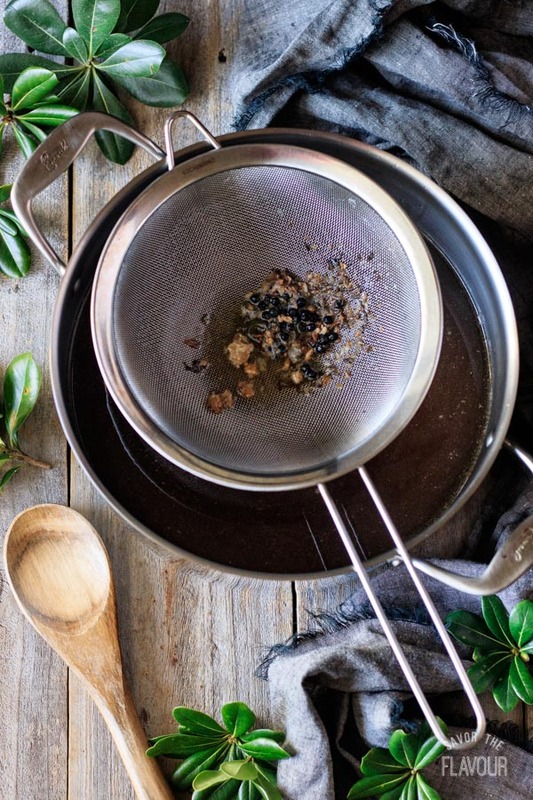 Strain the broth by pouring it through a fine mesh sieve into a large bowl. 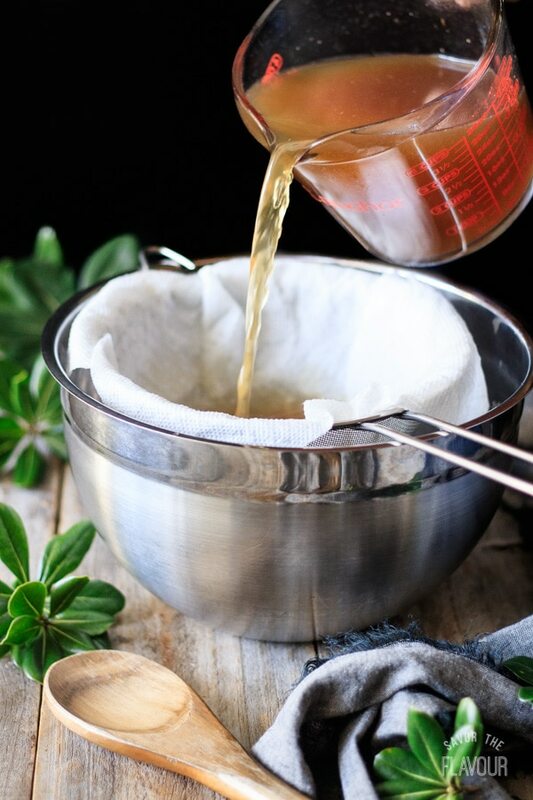 If desired, strain a second time, this time lining the sieve with damp paper towels. The paper towels will catch more of the small particles than cheesecloth would, and should result in a clearer looking broth. Cool on the counter, then refrigerate. Once cold, it’s easier to remove any remaining fat floating on top. To freeze, pour completely cooled broth in large airtight mason jars, leaving about 1 inch of head space to allow for expansion, and freeze for up to 3 months. You can also store the broth in freezer bags for soups or in ice cubes for gravies or rice dishes. 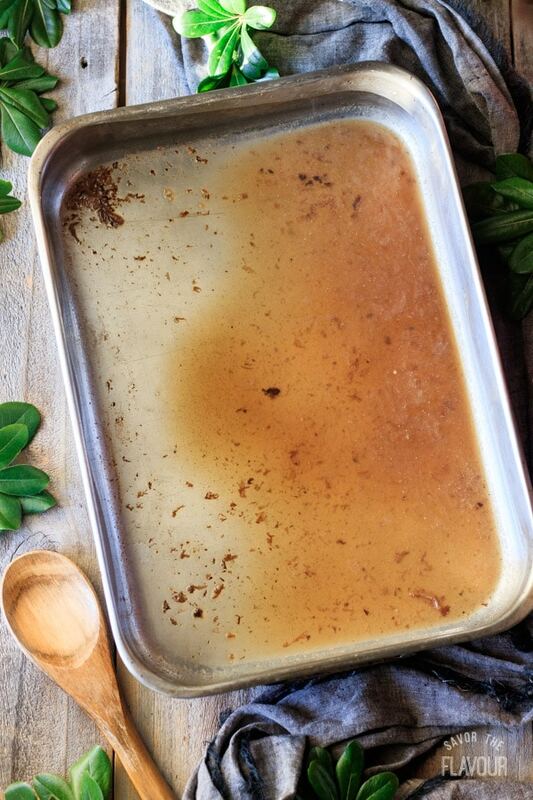 If you plan on drinking this bone broth in a mug, store it in 1 cup freezer containers. Use for a base for turkey gravy, turkey soup, rice dishes, turkey tetrazinni, or turkey stroganoff. Drink this broth in a mug, as this nutrient powerhouse is great for sipping on a cold winter day. The nutrition facts on this recipe include all the veggies and spices.